Tony Babcock was born in Kingston Ontario (no, not in the penitentiary) and realized that he needed to be the centre of attention. After his parents shipped him off to acting school, and he became old enough to read, he appeared on stage in more than twenty productions including; “The Importance of Being Ernest” (Algernon), “A Midsummer Night’s Dream” (Nick Bottom), “Lost In Yonkers” (Arty), “Leader of the Pack” (Gus) and many others. 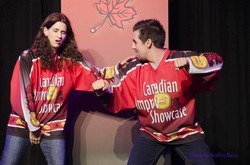 Prior to moving to Toronto he was with the “Highly Improvable Improv Troupe” in Kingston. He was a part of the “Theatre Complete Focus Program” where he studied mask, monologue, mime, movement and just about everything else that starts with an “m”. He has trained with Second City, Bad Dog, Impatient Theatre Co., Tom Todoroff, Michael Shore and many others. He also runs his own weekly improv class for adults/teens called "Improv Your Acting" (www.improvyouracting.com) and is an indie film producer. 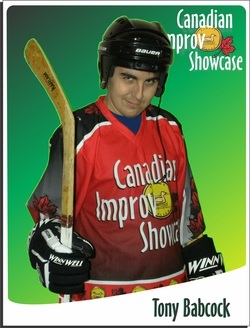 CiS has been a great home base for Tony for many years and he is very happy to be a part of the improv-amily!